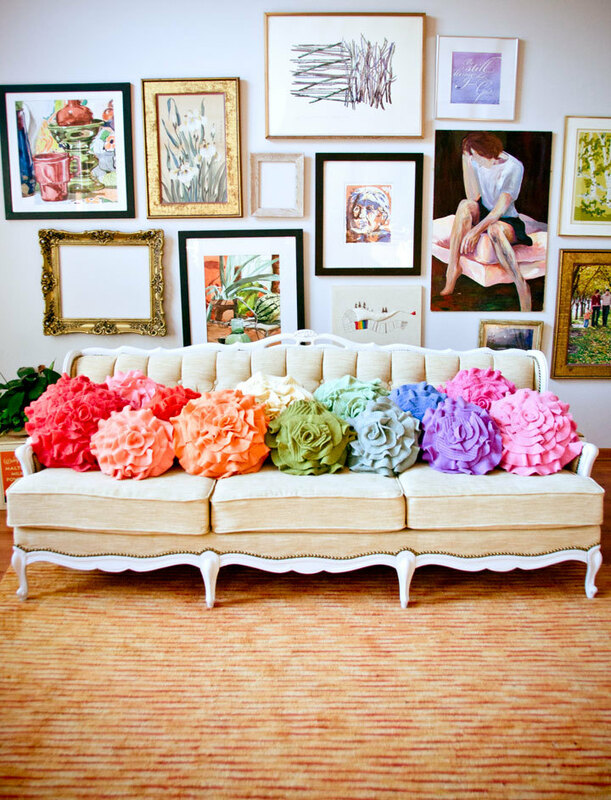 Marriage Equality + Pride: Decorating with Chic Rainbows! If your Facebook feed looks anything like mine, every single post is celebrating the momentous Supreme Court decision that everyone in the United States deserves marriage equality!! San Francisco’s City Hall, all lit up for Pride. This photo is by Joe Parks! Earlier today I ran to my computer to find adorable rainbow-y gay decor to celebrate (because otherwise I have been removing basically all color to achieve a mostly-black-and-some-white aesthetic in the living room) – and that’s when I realized that it isn’t that straight-forward (lol… straight-gay pun… #seewhatididthere) to find ways to decorate with a rainbow in your home without it looking like a literal Gay Pride flag. The “Rainbow” rug by Sonya Winner – I love the pattern. Maybe the most obvious way to outfit your home with a rainbow that still feels sophisticated and chic is to put it on your walls as art. One of my favorite contemporary California artists is Raul de la Torre in Los Angeles. His large, abstract multimedia pieces are beautifully textural, combining thick applications of paint and THREAD which he embroiders through the canvas! Many of his pieces are super colorful, and would add color and visual interest to even the most strictly “neutral” interiors. If you’re in San Francisco or New York City, Happy Pride!!!!!!!!! May your entire world – from the insides of your home to every lamp post on the streets – be covered in vivid rainbow celebration all weekend!